It's always been my dream to have flying lessons. I had a dream about school last night. A bad or frightening dream is called a nightmare. His dream was to give up his job and live in the country. I had lots of dreams last night. In my dream I flew to a forest of enormous trees. Her dream is to make a movie. She had dreams of university. I fulfilled a childhood dream when I became champion. I have just met the man of my dreams (=the perfect man)! I’ve finally found my dream house. Win a dream holiday for two in San Francisco! Ruth went about her tasks in a dream. Marriage to her is a dream come true. The plan worked like a dream. If you think that all homeless people have it as easy as me, then you are living in a dream world. Her latest boyfriend is an absolute dream. Some performers are a dream to work with; others are not. She’s every adolescent schoolboy’s dream. ▪ have a dream I had a dream about you last night. ▪ a bad dream (=unpleasant or frightening) The movie gave the kids bad dreams. ▪ a strange/weird dream Sometimes I have a strange dream in which I try to speak but I can’t. ▪ a vivid dream (=very clear) In a vivid dream he saw a huge coloured bird flying above his head. ▪ a recurrent/recurring dream (=that you have many times) Having recurrent dreams is a very common experience. ▪ be/seem like a dream (=seem unreal) That summer was so wonderful it seemed like a dream. ▪ Sweet dreams! (=said to someone who is going to bed) Good night, Sam! Sweet dreams! ▪ have a dream/dreams I had dreams of becoming a doctor. ▪ achieve/fulfil/realize a dream (=do or get what you want) He had finally achieved his dream of winning an Olympic gold medal. ▪ pursue/follow a dream (=try to do or get what you want) She left her home town to pursue her dreams. ▪ dream a dream literary (=have a wish) We can dream great dreams for ourselves and others. ▪ big/great dreams (=a wish to achieve great things) She was a little girl with big dreams. ▪ an impossible dream (=about something that cannot happen) Having a number one record had seemed an impossible dream. ▪ a childhood dream (=that you had when you were a child) I had a childhood dream of becoming an astronaut. ▪ a lifelong dream (=that you have had all your life) His lifelong dream had been to write a novel. ▪ a distant dream (=that it will take a long time to achieve) Peace in this area may still be a distant dream. ▪ a dream comes true (=something you want happens) I’d always wanted to go to Africa and at last my dream came true. ▪ the man/woman/house etc of your dreams (=the perfect one for you) We can help you find the house of your dreams. ▪ not/never in your wildest dreams (=used to say that you had never expected something to happen) Never in my wildest dreams did I think I would win the competition. ▪ beyond your wildest dreams (=better or more than you ever hoped for) Suddenly he was wealthy beyond his wildest dreams. ▪ dream the thoughts, images, and feelings that go through your mind while you are asleep: I had a strange dream last night -- you and I were in some sort of forest. ▪ nightmare a very unpleasant and frightening dream: She still has terrible nightmares about the accident. ▪ daydream a series of pleasant thoughts that go through your mind when you are awake, so that you do not notice what is happening around you: Neil was in a daydream, and didn’t hear the teacher call his name. ▪ reverie formal a state of imagining or thinking about pleasant things, that is like dreaming: The doorbell rang, shaking her from her reverie. ▪ dream something very special that you want to do and that you think about a lot, especially something that is not very likely to happen: As a teenager, his dream was to become a professional footballer. ▪ ambition something that you want to achieve and that you work hard to achieve, especially in your work: My ambition had always been to start my own business. ▪ aspirations the important things that people want from their lives – used especially about the things a society or a large group of people wants: It’s important that young people think seriously about their career aspirations. ▪ pipe dream a dream that is impossible or is extremely unlikely to happen: Is world peace no more than a pipe dream? • I had a vivid dream about my old school. • I thought someone came into the bedroom, but it was just a dream. • Don't think about it. You'll only give yourself bad dreams. • Her lifelong dream was to be a famous writer. • He wanted to be rich but it was an impossible dream. • If I win, it will be a dream come true. • She tried to turn her dream of running her own business into reality. • a dream car/house/job, etc. • I've finally found the man of my dreams. • It was the end of all my hopes and dreams. • She walked around in a dream all day. • That meal was an absolute dream. more at beyond your wildest dreams at wild adj. Middle English: of Germanic origin, related to Dutch droom and German Traum, and probably also to Old English drēam ‘joy, music’. • She wandered round the house in a dream. • After Betty retired, she and her husband designed and built their dream house. • After Betty retired, she designed and built her dream house. • At last I feel I'm living the dream. • At last his dreams were fulfilled. • Born a poor boy in Kansas, he lived the American dream as a successful inventor. • He had a prophetic dream about a train crash the night before the disaster. • He left his job to pursue his dream of opening a restaurant. • He never abandoned his dream of finding his real mother. • He put all his efforts into making his dream of a united country come true. • He spent his life chasing pipe dreams= fantasies that are unlikely to come true. • Her biggest dream was to become a singer. • His plans to travel the world now seemed like a distant dream. • His waking dream was rudely interrupted by the telephone. • I had a very disturbing dream last night. • I hardly ever remember my dreams. • I hope my dream about prison won't come true! • I was awoken from my dream by a knock at the door. • Images of the crash still haunted his dreams years later. • In her dream, she was on board a ship heading for America. • Peace no longer seemed an impossible dream. • She confided in him all her hopes and dreams. • She fell asleep and dreamed strange dreams. • She found herself standing in front of the crowded hall and making her speech, as if in a dream. • She had this romantic dream of living in a windmill. • She is plagued by strange dreams. • She opened her eyes and the dream faded. • The government is living in a dream world if they think voters will agree to higher taxes. • The injury shattered her dream of running in the Olympics. • The victory keeps San Marino's dream of a World Cup place alive. • Their cruise in the Bahamas was a dream come true. • Their dream turned into a nightmare as the cruise ship began to sink. • They achieved a success beyond their wildest dreams. • If I win it will be a dream come true. • If he thinks it's easy to get a job he's living in a dream world. • This is a chance to fulfil a childhood dream. • What would be your dream job? I had a very odd dream about you last night. [ + that ] Paul had a dream that he won the lottery. Winning all that money was a dream come true . Win the house of your dreams in our fantastic competition! 1) N-COUNT A dream is an imaginary series of events that you experience in your mind while you are asleep. I had a dream that I was in an old study, surrounded by leather books. 2) VERB When you dream, you experience imaginary events in your mind while you are asleep. 3) N-COUNT: usu with supp You can refer to a situation or event as a dream if you often think about it because you would like it to happen. You can make that dream come true. 4) VERB If you often think about something that you would very much like to happen or have, you can say that you dream of it. [V that] I dream that my son will attend college and find a good job. 5) ADJ: ADJ n You can use dream to describe something that you think is ideal or perfect, especially if it is something that you thought you would never be able to have or experience. He had his dream house built on the banks of the river Bure. ...a dream holiday to Jamaica. 6) N-SING: poss N If you describe something as a particular person's dream, you think that it would be ideal for that person and that he or she would like it very much. 8) N-COUNT: usu sing, with supp You can refer to a situation or event that does not seem real as a dream, especially if it is very strange or unpleasant. When the right woman comes along, this bad dream will be over. 9) VERB: with neg (emphasis) If you say that you would not dream of doing something, you are emphasizing that you would never do it because you think it is wrong or is not possible or suitable for you. [V of -ing/n] My sons would never dream of expecting their clothes to be ironed. 10) VERB: with brd-neg (emphasis) If you say that you never dreamed that something would happen, you are emphasizing that you did not think that it would happen because it seemed very unlikely. I find life more charming and more astonishing than I'd ever dreamed. 12) PHRASE If you tell someone to dream on, you mean that something they are hoping for is unlikely to happen. 13) PHRASE: PHR after v, v-link PHR If you say that you are in a dream, you mean that you do not concentrate properly on what you are doing because you are thinking about other things. All day long I moved in a dream, my body performing its duties automatically. 14) PHRASE: PHR after v If you say that someone does something like a dream, you think that they do it very well. If you say that something happens like a dream, you mean that it happens successfully without any problems. His ship had sailed like a dream. 15) PHRASE: n PHR If you describe someone or something as the person or thing of your dreams, you mean that you consider them to be ideal or perfect. This could be the man of my dreams. 16) PHRASE: with brd-neg, PHR with cl (emphasis) If you say that you could not imagine a particular thing in your wildest dreams, you are emphasizing that you think it is extremely strange or unlikely. Never in my wildest dreams could I imagine there would be this kind of money in the game. 17) PHRASE: n PHR, PHR after v, v-link PHR (emphasis) If you describe something as being beyond your wildest dreams, you are emphasizing that it is better than you could have imagined or hoped for. She had already achieved success beyond her wildest dreams. • He had a dream about climbing a mountain. • You were in my dream last night. • She indulged in dreams [=fantasies] of living in a palace. • I've found the man/woman of my dreams. • They succeeded beyond their wildest dreams. • Never in my wildest dreams did I imagine it would be so much fun. • If you think the work will be easy, you're living in a dream world. • He has had a lifelong dream of becoming an actor. • It's a dream of mine to own a house in the country. • Tell me your hopes and dreams. • She followed/fulfilled her dreams. • Making it to the Olympics was a dream come true. • Many believe that worldwide peace is an impossible dream. • The meal was a garlic lover's dream. • He's every woman's dream. • She's still trying to find her dream husband. • Managing a professional baseball team is his dream job. • They just moved into their dream home. • It's a dream of a house. • The new car is a dream to drive. = The new car drives like a dream. • He was walking around in a dream. I have a terrible fear of dogs. My fears for his safety were unnecessary. There are fears that share prices could decrease still further. The girl’s parents expressed fears for her safety. The children looked at her in fear. People must be able to express their views without fear of criticism. She finally ran away for fear that he would kill her. He got to the station early, for fear of missing her. There’s no fear of revolt now. The Italian manager must have put the fear of God into his team. The law must be enforced without fear or favour. ▪ sb’s worst/greatest fear Her worst fear was never seeing her children again. ▪ an irrational fear (=one that is not reasonable) He grew up with an irrational fear of insects. ▪ a deep-seated fear (=very strong and difficult to change) He exploited people’s deep-seated fears about strangers. ▪ groundless (=without any reason) As it turned out, these fears were groundless. ▪ conquer/overcome your fear (=stop being afraid) She managed to conquer her fear of flying. ▪ shake/tremble with fear He was shaking with fear after being held at gunpoint. ▪ show fear She was determined not to show fear. ▪ be gripped by fear (=be very afraid) We were gripped by fear as the boat was tossed around by the waves. ▪ be paralysed with fear (=be so afraid that you cannot move) Bruce was paralysed with fear when he saw the snake. ▪ confirm sb’s fears (=show that what you were afraid of has actually happened) The look on Colin’s face confirmed all my worst fears. ▪ ease/allay/dispel sb’s fears (=help someone stop being afraid) Frank eased my fears about not being able to speak the local language. ▪ be in fear of/for your life (=be afraid that you may be killed) Celia was in fear of her life when she saw the truck coming toward her. ▪ be full of fear The residents are too full of fear to leave their houses. ▪ be/live in fear of something (=be always afraid of something) They were constantly in fear of an enemy attack. ▪ have no fear of something He had no fear of death. ▪ sb’s hopes and fears We each had different hopes and fears about the trip. ► Do not say that someone 'has fear'. Say that someone is frightened or is afraid. ▪ fear a feeling of being frightened: He was trembling with fear. | Fear of failure should not stop you trying. ▪ terror a feeling of great fear, because you think that something terrible is about to happen: She let out a scream of pure terror. ▪ fright a sudden feeling of fear, or a situation that makes you feel this: My body was shaking with fright. | You gave me a fright! | He’s had a bit of fright, that’s all. ▪ panic a sudden feeling of fear or nervousness that makes you unable to think clearly or behave sensibly: She was in such a panic that she hardly knew what she was doing! | There were scenes of sheer panic immediately following the bomb blast. ▪ alarm a feeling of fear or worry which shows in your voice or behaviour, because you think something bad might happen: When I mentioned her name, he looked up at me in alarm. | The streets were calm and there was no sign of alarm. ▪ foreboding /fɔːˈbəʊdɪŋ $ fɔːrˈboʊ-/ a feeling that something bad or unpleasant might happen although there is no obvious reason why it should: She felt the same sense of foreboding she had before her father died. ▪ phobia /ˈfəʊbiə $ ˈfoʊ-/ a permanent strong unreasonable fear of something: I had a phobia about going to the dentist. • Her eyes showed no fear. • The child was shaking with fear. • ~ (of sb/sth) (a) fear of the dark/spiders/flying, etc. • We lived in constant fear of losing our jobs. • Alan spoke of his fears for the future. • The doctor's report confirmed our worst fears. more at fools rush in (where angels fear to tread) at fool n., strike fear etc. into sb/sb's heart at strike v.
Old English fǣr ‘calamity, danger’, fǣran ‘frighten’, also ‘revere’, of Germanic origin; related to Dutch gevaar and German Gefahr ‘danger’. • She cried out in fear/fright. • I have a fear of spiders. ¤ I have a fright of spiders. These are all words for the bad feeling you have when you are afraid. fear • the bad feeling that you have when you are in danger, when sth bad might happen, or when a particular thing frightens you: ▪ (a) fear of flying ◊ ▪ She showed no fear. terror • a feeling of extreme fear: ▪ Her eyes were wild with terror. panic • a sudden feeling of great fear that cannot be controlled and prevents you from thinking clearly: ▪ I had a sudden moment of panic. alarm • fear or worry that sb feels when sth dangerous or unpleasant might happen: ▪ The doctor said there was ▪ no cause for alarm ▪. fright • a feeling of fear, usually sudden: ▪ She cried out in fright. • Doctors have voiced fears that we may be facing an epidemic. • Fears are growing of a new oil embargo. • He lied out of fear. • He ran away in fear. • His face was white with fear. • It was the first time she had experienced real fear. • My biggest fear was that my children would get sick. • My worst fears were confirmed. • Nobody refused for fear of being fired. • Nobody refused for fear of losing their job. • Our fears proved unfounded. • Public fears about the disease increased. • She did not know why she should feel such fear. • She managed to overcome her fear. • She stared at him without fear. • The boy showed no fear. • The government is anxious to allay the public's fears. • The men hesitated in fear of whatever was to come next. • The men set off in fear and trepidation. • The people live in fear of attack by the bandits. • The pupils obeyed through fear of punishment. • The sound of gunfire struck fear into the hearts of the villagers. • They have a terrible fear of failure. • This incident has fuelled fears of a full-scale war. • This stoked fears of financial difficulties. • When she heard the news, some of her fear subsided. • He spoke of his fears for the future. • I had to run away for fear that he might one day kill me. Trembling with fear, she handed over the money to the gunman. Even when the waves grew big, the boy showed no (signs of) fear. The low profit figures simply confirmed my worst fears. [ + that ] There are fears that the disease will spread to other countries. Lakisha sat inside, in fear of her life, until the police came. Malcolm knows the city well, so there's no fear of us getting lost (= we will not get lost) . They wouldn't let their cat outside for fear (that) it would get run over. I didn't want to move for fear of wak ing her up. 1) N-VAR: oft N of n/-ing Fear is the unpleasant feeling you have when you think that you are in danger. I was sitting on the floor shivering with fear because a bullet had been fired through a window. London Zoo is running hypnosis programmes to help people overcome their fear of spiders. 2) VERB If you fear someone or something, you are frightened because you think that they will harm you. [V n] It seems to me that if people fear you they respect you. 3) N-VAR: with supp, oft N of n/-ing, N that A fear is a thought that something unpleasant might happen or might have happened. His fears might be groundless. ...the fear that once a war began it would soon pass beyond the ability of either side to manage it. 4) VERB If you fear something unpleasant or undesirable, you are worried that it might happen or might have happened. [V n] More than two million refugees have fled the area, fearing attack by loyalist forces. 5) N-VAR: oft N that, N of n/-ing If you say that there is a fear that something unpleasant or undesirable will happen, you mean that you think it is possible or likely. There is a fear that the freeze on bank accounts could prove a lasting deterrent to investors. 6) VERB If you fear for someone or something, you are very worried because you think that they might be in danger. [V for n] He fled on Friday, saying he feared for his life. 7) N-VAR: N for n If you have fears for someone or something, you are very worried because you think that they might be in danger. He also spoke of his fears for the future of his country's culture. ...fear for her own safety. 8) VERB If you fear to do something, you are afraid to do it or you do not wish to do it. [V to-inf] Old people fear to leave their homes. 10) PHRASE: PHR n/-ing, usu v-link PHR, PHR after v If you are in fear of doing or experiencing something unpleasant or undesirable, you are very worried that you might have to do it or experience it. The elderly live in fear of assault and murder. 11) PHRASE: PHR n/-ing, PHR with cl If you take a particular course of action for fear of something, you take the action in order to prevent that thing happening. No one dared shoot for fear of hitting Pete. You'll get the right training, never fear. 14) PHRASE: V inflects If someone or something puts the fear of God into you, they frighten or worry you, often deliberately. At some time or other Eve had obviously put the fear of God into her. • He was trembling with fear. • They regarded their enemies with fear and hatred/loathing. • I've been trying to overcome my fear of flying. • They lived in (constant) fear of air raids during the war. • The doctor's diagnosis confirmed our worst fears. • The government is trying to allay/alleviate/ease fears of a recession. • Employees expressed fears that the company would go out of business. • He told us about all his hopes and fears. • She has a morbid fear of cats. ✦If you are in fear of your life or (US) in fear for your life, you are afraid of being killed. • She claimed that she shot the burglar because she was in fear for her life. ✦To put the fear of God into someone is to frighten someone very badly. • The bad economic news has put the fear of God into investors. • “Are you going to tell her the truth?” “No fear [=never fear, fear not], mate: she won't hear a thing from me!” synonyms fear, dread, alarm, and fright mean painful emotion felt because of danger. fear is the most general word and suggests a continuing emotional state. • people living in fear of violent crimes dread suggests a strong feeling of not wanting to accept or deal with something bad or unpleasant. • the dread felt by people awaiting bad news alarm may suggest a strong emotion caused by an unexpected or immediate danger. • They view the worsening food shortage with alarm. fright suggests a feeling caused by something unexpected and often suggests a brief emotion. • The creaking door gave them a fright. If the product doesn't work, you are given the choice of a refund or a replacement. We have no choice. We have to leave. The cinema has a choice of six different films. Voters have a choice between three main political parties. You have a choice of hotel or self-catering accommodation. He has to make some important choices. They gave us no choice in the matter. It was a small shop and there wasn’t much choice. There is a choice of four different colours. We offer a wide choice of wines and beers. Consumers these days are spoilt for choice British English (=have a lot of things to choose from). I don’t really like her choice of jewellery. I think London was a good choice as a venue. My first choice of college was Stanford. She lives alone by choice. My children cannot go to the school of their choice. It is the drug of choice for this type of illness. ▪ have a choice Students have a choice between German and Spanish. ▪ make a choice (=choose something) One of our course advisors can help you to make your choice. ▪ give somebody a choice Her doctor gave her a choice: take medicine or lose weight. ▪ be faced with a choice He was faced with a difficult choice. ▪ have no choice (but to do something) The men had no choice but to obey. ▪ leave somebody with no choice I was left with no choice but to resign. ▪ exercise your choice formal (=make a choice - used especially when talking about someone using their right to choose) Everyone should have the right to exercise choice in matters of relationships. ▪ the right/wrong choice I think you’ve made the right choice. ▪ a difficult choice It was a very difficult choice for me. ▪ a stark choice (=a choice between two unpleasant things that you must make) We faced a stark choice: steal or starve. ▪ (a) free choice Students have an entirely free choice of what to study at university. ▪ an informed choice (=a choice based on knowledge of the facts about something) The patient should have enough information to make an informed choice. ▪ consumer choice (=the opportunity for people to choose between different products) I believe in free trade and consumer choice. ▪ parental choice The aim is to extend parental choice in education. ▪ freedom of choice Patients should have more freedom of choice. ▪ given the choice (=if you had a choice) Given the choice, I probably wouldn’t work. ▪ have no choice in the matter The village people had no choice in the matter. ▪ choice: choice of: The school seems OK, but there isn’t a great choice of courses. | have a choice (=be able to choose from several things): With her high grades and athletic skill, Celeste had her choice of colleges. | have no choice but to do something (=to be forced to do something because there is nothing else you can choose): Spooner says he had no choice but to file for bankruptcy. | wide choice (=a lot of things to choose from): There is a wide choice of hotels and hostels in the town. ▪ option one of the things that you can choose to do in a particular situation: He basically has two options: he can have the surgery, or he can give up playing football. | keep/leave your options open (=delay choosing so that you continue to have several things to choose from): I haven’t signed any contracts yet – I want to keep my options open. ▪ alternative one of two or more ways of doing something: Did you consider other alternatives before you moved in with Lucy? | alternative to: There is no practical alternative to our current policy. | have no alternative (=to not have a choice): He says he doesn’t want to see a doctor, but I’m afraid he has no alternative. ▪ choice something or someone that has been chosen: Maria was very pleased with her choice. | first/second/third choice (=the thing you wanted most, the thing you wanted most after that etc): Greece was our first choice for a vacation, but all the flights were full. | somebody’s choice of: I don’t like his choice of friends. • We are faced with a difficult choice. • We aim to help students make more informed career choices. • Resources are finite, and choices have to be made between competing priorities and needs. • There is a wide range of choices open to you. • If I had the choice, I would stop working tomorrow. • He had no choice but to leave (= this was the only thing he could do). • She's going to do it. She doesn't have much choice, really, does she? • This government is committed to extending parental choice in education. • After a delicious meal with free wine, the choice is yours: a quiet drink in the bar, the late night disco or a stroll along the beach beneath a starry sky. • Sandy had to tell his tale in halting Italian. Since Franco spoke no English, he had no choice in the matter. • She's the obvious choice for the job. • Hawaii remains a popular choice for winter vacation travel. • This colour wasn't my first choice. • She wouldn't be my choice as manager. • I don't like his choice of friends (= the people he chooses as his friends). • The menu has a good choice of desserts. • There wasn't much choice of colour. Middle English: from Old French chois, from choisir ‘choose’, of Germanic origin and related to choose. • Many women make a choice between family and career. 2. U, C, usually sing. • If I had the choice, I'd give up work tomorrow. • He had no choice but to (= he had to) leave. Choice, option or alternative? Alternative is slightly more formal than option or choice, and is more frequently used to talk about choosing between two things rather than several. • She is the first choice for the job. These are all words for a person or thing that is chosen, or that is liked more than others. choice • a person or thing that is chosen: ▪ She's the obvious choice for the job. favourite/favorite • a person or thing that you like more than the others of the same type: ▪ Which one's your favourite? preference • a thing that is liked better or best: ▪ Tastes and preferences vary from individual to individual. Your favourites are the things you like best, and that you have, do, listen to, etc. often; your preferences are the things that you would rather have or do if you can choose. selection • a number of people or things that have been chosen from a larger group: ▪ A selection of reader's comments are published below. pick • (rather informal, especially NAmE) a person or thing that is chosen: ▪ She was his pick for best actress. These are all words for sth that you choose to do in a particular situation. option • something that you can choose to have or do; the freedom to choose what you do: ▪ As I see it, we have two options… ◊ ▪ Students have the option of studying abroad in their second year. Option is also the word used in computing for one of the choices you can make when using a computer program: ▪ Choose the ‘Cut’ option from the Edit menu. choice • the freedom to choose what you do; something that you can choose to have or do: ▪ If I had the choice, I would stop working tomorrow. ◊ ▪ There is a wide range of choices open to you. alternative • something that you can choose to have or do out of two or more possibilities: ▪ You can be paid in cash weekly or by cheque monthly: those are the two alternatives. Choice is slightly less formal than option and alternative is slightly more formal. Choice is most often used for ‘the freedom to choose’, although you can sometimes also use option (but not usually alternative): ▪ If I had the choice/option, I would… ◊ If I had the alternative, I would… ◊ ▪ parental choice in education ◊ parental option/alternative in education. Things that you can choose are options, choices or alternatives. However, alternative is more frequently used to talk about choosing between two things rather than several. possibility • one of the different things that you can do in a particular situation: ▪ We need to explore a wide range of possibilities. ◊ ▪ The possibilities are endless. Possibility can be used in a similar way to option, choice and alternative, but the emphasis here is less on the need to make a choice, and more on what is available. • Bill is the obvious choice for captain of the team. • Doctors have to make moral choices every day of their lives. • Everyone in a democracy has the right to exercise choice. • First prize will be a meal for two at a restaurant of your choice. • He had no choice about that. • I don't think much of her choice of outfit. • I had no choice but to cancel my holiday. • I now had a clear choice: either I accept their terms or I leave. • I think she's a very good choice for captain. • I wouldn't have come to this bar by choice! • In the end, the choice was quite easy. • Maria defended her choice of name for the child. • Mary is a popular choice as chair of the committee. • Much ill health is the result of poor diet and lifestyle choices. • Our first choice for a holiday is the north of Scotland. • Our first choice for a site was already taken. • People were asked about their top choices for meeting locations. • She faced the stark choice of backing the new plan or losing her job. • She has a choice between three different universities. • She questioned the choice of Murphy for this role. • She was starting to regret her choice. • Smoking may limit your choice of contraception. • Students have a free choice from a range of subjects. • The hotel is the preferred choice for business people. • The shop has a very limited choice of ties. • The way he behaved meant that we had no choice in the matter. • These are personal choices that people must make for themselves. • We gave her the choice, and she decided she'd like a bike for her birthday. • We offer a choice of ten different destinations. • When did you make a conscious choice to become an artist? • You can have first choice of all the rooms. • Your decision leaves me with no choice but to resign. • Your needs should dictate your choice. • I don't like his choice of friends. • Many women are forced to make a choice between family and career. • The choice is yours: a quiet drink in the bar, the late night disco or a stroll along the beach. It's a difficult choice to make . It's your choice/The choice is yours (= only you can decide) . It was a choice between pain now or pain later, so I chose pain later. Now you know all the facts, you can make an informed choice. I'd prefer not to work but I do n't have much choice (= this is not possible) . He had no choice but to accept (= he had to accept) . Is she single by choice? Champagne is their drink of choice (= the one they most often drink) . There wasn't much choice on the menu. The evening menu offers a wide choice of dishes. The dress is available in a choice of colours. Harvard was not his first choice. He wouldn't be my choice as a friend. This type of nursery care may well be the best choice for your child. 1) N-COUNT If there is a choice of things, there are several of them and you can choose the one you want. Club Sportif offer a wide choice of holidays. 2) N-COUNT: usu poss N Your choice is someone or something that you choose from a range of things. Although he was only grumbling, his choice of words made Rodney angry. ...Fortnum and Mason's choicest chocolates. 4) PHRASE: V inflects If you have no choice but to do something or have little choice but to do it, you cannot avoid doing it. They had little choice but to agree to what he suggested. 5) PHRASE: n PHR The thing or person of your choice is the one that you choose. In many societies children still marry someone of their parents' choice. • He has some important choices to make. • You made a good/bad choice. • She was faced with a difficult choice. • You can either accept the job or not. It's your choice. • I read about the various options so that I could make an informed choice. • Given the choice, I'd rather stay home tonight. • He had no choice in the matter. = He did not have a choice in the matter. • You leave me (with) no choice. • They gave/offered me a choice between an automatic or standard transmission. • A flexible health insurance plan gives patients more choice about doctors and coverage. • He had little choice in the matter. = He did not have much choice in the matter. • You have the choice of coffee or tea. • (chiefly Brit) Customers are spoiled for choice [=customers have a lot of choices] when buying a new car. • There is a wide range of choices. • Other choices on the menu looked equally tempting. • He is happy with his choice. • I don't like her choice of friends. • Selling our car was the right choice. ✦If you do something by choice or out of choice, you choose to do it. • No one forced them to do it. They acted out of choice. • Wine was his beverage of choice. ✦A person or thing of your choice is a person or thing that you have chosen. • They said I could bring a guest of my choice to the party. • The meal is served with a beverage of your choice. Prices have risen by 20 %. The sun rises in the east and sets (= goes down) in the west. Sales rose by 20% over the Christmas period. The research budget rose from £175,000 in 1999 to £22.5 million in 2001. Temperatures rarely rise above freezing. The number of people seeking asylum in Britain has risen sharply. The divorce rate has risen steadily since the 1950s. The country faces economic recession and rising unemployment. The police seem unable to cope with the rising tide of (=large increase in) car crime. ▪ Prices have gone up a lot. The floodwaters began to rise again. She watched the bubbles rise to the surface. Smoke rose from the chimney. The road rises steeply from the village. The waves rose and fell. Then she picked up her bag and rose to leave. The chairman rose from his chair and came forward to greet her. He put down his glass and rose to his feet. He rose to the rank of major. He had swiftly risen to prominence during the 1950s. Mussolini rose to power in Italy in 1922. He rose to become chairman of the company. She had joined the company as a secretary and risen through the ranks (=made progress from a low position to a high position) to become a senior sales director. The cliffs rose above them. The bridge rose majestically into the air. The sound of traffic rose from the street below. Her voice rose above the shouts of the children. His voice rose in frustration. She could sense her temper rising again. There was an atmosphere of rising excitement in the school. The doctor sounded optimistic and John’s hopes rose. The team rose to the challenge. They rose up and overthrew the government. The prisoners rose against the guards and escaped. They rose in rebellion against the king. On the third day Jesus rose from the dead. The wind had risen again and it was starting to rain. The Rhine rises in Switzerland. ▪ sharply/steeply (=a lot in a short time) The value of the painting has risen sharply in recent years. ▪ dramatically (=a lot and very suddenly) Unemployment rose dramatically. ▪ rapidly/quickly/fast House prices rose rapidly last year. ▪ significantly (=in a way that shows something important) Male cancer rates rose significantly during the period 1969–78. ▪ substantially (=a lot) University fees have risen substantially. ▪ steadily My salary had risen steadily each year. ▪ slightly The water temperature had risen slightly. You expect a certain amount of criticism, but you have to rise above it. I try to rise above such prejudices. You shouldn’t rise to his comments. He refused to rise to the bait (=react in the way someone wanted him to). • Smoke was rising from the chimney. • The river has risen (by) several metres. • He was accustomed to rising (= getting out of bed) early. • They rose from the table. • She rose to her feet. • The House (= members of the House of Commons) rose at 10 p.m.
• The price of gas rose. • Gas rose in price. • Unemployment rose (by) 3%. • Air pollution has risen above an acceptable level. • She rose to power in the 70s. • He rose to the rank of general. • She rose through the ranks to become managing director. • Her voice rose angrily. • The wind is rising— I think there's a storm coming. • He felt anger rising inside him. • Her spirits rose (= she felt happier) at the news. • The hair on the back of my neck rose when I heard the scream. • The peasants rose in revolt. • He called on the people to rise up against the invaders. • Mountains rose in the distance. • The ground rose steeply all around. • The Thames rises in the Cotswold hills. • (figurative) Can a new party rise from the ashes of the old one? Old English rīsan ‘make an attack’, ‘wake, get out of bed’, of Germanic origin; related to Dutch rijzen and German reisen. rise/increase/grow/jump/go up/shoot up/soar in price, number, etc. rise/increase/grow/go up/climb/jump/rocket/shoot up/soar (by) 10%, 200, etc. • From the river the ground rises steeply towards the north. ▪ Student numbers in English language schools in this country increased ▪ from 66 000 in 2008 to just over 84 000 in 2009. ▪ The number of students increased ▪ by almost 30% compared with the previous year. ▪ Student numbers shot up ▪ / increased dramatically ▪ in 2009. ▪ The proportion of Spanish students rose sharply ▪ from 5% in 2008 to 14% in 2009. ▪ There was a significant rise ▪ in student numbers in 2009. ▪ The 2009 figure was 84 000, an increase of ▪ 28% on the previous year. ▪ The 2009 figure was 84 000, 28 per cent up ▪ on the previous year. ▪ As the chart shows, this can partly be explained by a dramatic increase ▪ in students from Spain. These words all mean to be in an upright position with your weight on your feet, or to put yourself in this position. stand • to be in an upright position with your weight on your feet: ▪ She was too weak to stand. ◊ ▪ Stand still ▪ when I'm talking to you! Stand is usually used with an adverb or prepositional phrase to show where or how sb stands, but sometimes another phrase or clause is used to show what sb does while they are standing: ▪ We stood talking for a few minutes. ◊ ▪ He stood and looked out to sea. get up • to get into a standing position from a sitting, kneeling or lying position: ▪ Please don't get up! stand up • to be in a standing position; to stand after sitting: ▪ Stand up straight! ◊ ▪ Everyone would stand up when the teacher entered the classroom. stand, get up or stand up? Stand usually means ‘to be in a standing position’ but can also mean ‘to get into a standing position’. Stand up can be used with either of these meanings, but its use is more restricted: it is used especially when sb tells sb or a group of people to stand. Get up is the most frequent way of saying ‘get into a standing position’, and this can be from a sitting, kneeling or lying position; if you stand up, this is nearly always after sitting, especially on a chair. If you want to tell sb politely that they do not need to move from their chair, use get up: Please don't stand up! rise • (formal) to get into a standing position from a sitting, kneeling or lying position: ▪ Would you all rise, please, to welcome our visiting speaker. get to your feet • to stand up after sitting, kneeling or lying: ▪ I helped her to get to her feet. be on your feet • to be standing up: ▪ I've been on my feet all day. • Adam rose abruptly from the table. • Entry standards into the profession are set to rise further. • He made to rise but found his legs were not strong enough to support him. • He rose early and went for a walk. • He rose to his full height and leaned across the table. • House prices have risen sharply in recent months. • Inflation rose from 2% to 5% last year. • Lush green mountains rise up behind the airport. • Pensions will rise in line with inflation. • She rose shakily to her feet and looked around. • She rose slowly from her chair to greet us. • She rose unsteadily to her feet. • Smoke rose from the chimney. • Somehow he managed to rise to a sitting position. • Tall chimneys rise into the air. • The cost of health care is rising faster than ever. • Unemployment has risen by 25 000 this month. • Behind the house the ground rises steeply to the north. • Interest rates are expected to rise from 4.5% to 5% in the next six months. • The price of gas has risen by 3%. • Would you all rise, please, to welcome our visiting speaker. The balloon rose gently (up) into the air. At 6 a.m. we watched the sun rise (= appear and move upwards in the sky) . When you put yeast in bread and bake the bread, it rises (= gets bigger) . New buildings are rising (= being built) throughout the city. The River Cam rises (= first comes out of the ground) in/at a place called Ashwell. figurative Murmurs of disapproval rose from (= came from) the crowd. She rose from her chair to welcome us. He rose to his feet to deliver his speech. My grandfather rises at five every morning to do his exercises. Inflation is rising at/by 2.1 percent a month. The wind/storm is rising (= beginning to get stronger) . 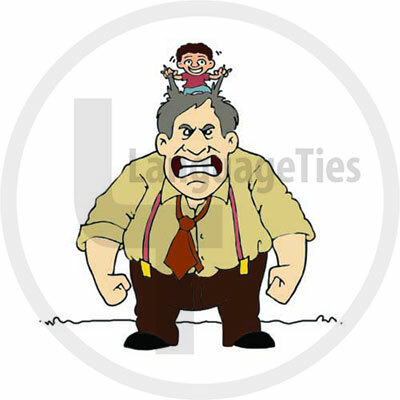 Tempers are rising (= people are becoming angry) . My spirits rise (= I feel happier) whenever I think of my friends. She felt panic and terror rise in her whenever she thought of the future. His voice rose (= became louder or higher) as he got angry. After a long career with the company, she has risen to the position of chief executive. He rose to power as the country emerged from its financial crisis. She quickly rose through the ranks to become head of marketing. The singer has risen from humble origins to become one of the most successful entertainers of all time. The ground rises over there. The castle is built on rising ground (= ground higher than areas around it) . You can see the Alps rising (= showing as a higher area) in the distance/ above the clouds. The people rose (up) against the oppressor/tyrant/dictator. Parliament/The court rose at 6 p.m.
1) VERB If something rises, it moves upwards. The powdery dust rose in a cloud around him. Rise up means the same as rise. V P from/to n Spray rose up from the surface of the water... V P Black dense smoke rose up. He looked at Livy and Mark, who had risen to greet him. Rise up means the same as rise. Also V P V P from n The only thing I wanted was to rise up from the table and leave this house. Tony had risen early and gone to the cottage to work. 4) VERB When the sun or moon rises, it appears in the sky. He wanted to be over the line of the ridge before the sun had risen. [V prep/adv] The towers rise out of a concrete podium. Rise up means the same as rise. V P prep/adv The White Mountains rose up before me. 6) VERB If the level of something such as the water in a river rises, it becomes higher. The waters continue to rise as more than 1,000 people are evacuated. ...the tides rise and fall. 7) VERB If land rises, it slopes upwards. [V-ing] The great house stood on rising ground. 8) N-COUNT: usu sing A rise is an area of ground that slopes upwards. I climbed to the top of a rise overlooking the ramparts. 9) VERB If an amount rises, it increases. [V-ing] The increase is needed to meet rising costs. 10) N-COUNT: N in n A rise in the amount of something is an increase in it. Foreign nationals have begun leaving because of a sharp rise in violence. He will get a pay rise of nearly ₤4,000. 12) N-SING: the N of n The rise of a movement or activity is an increase in its popularity or influence. The rise of racism in America is a serious concern. ...the rise of home ownership. 13) VERB If the wind rises, it becomes stronger. The wind was still rising, approaching a force nine gale. Rise up means the same as rise. V P Foxworth shivered as the wind rose up and roared through the beech trees. 14) VERB If a sound rises or if someone's voice rises, it becomes louder or higher. [V to n] His voice rose almost to a scream. 15) VERB If a sound rises from a group of people, it comes from them. [V from n] There were low, muffled voices rising from the hallway. Rise up means the same as rise. V P From the people, a cheer rose up. 16) VERB If an emotion rises in someone, they suddenly feel it very intensely so that it affects their behaviour. [V in n] The thought made anger rise in him and he went into a bar and had a double whisky. 17) VERB If your colour rises or if a blush rises in your cheeks, you turn red because you feel angry, embarrassed, or excited. 18) VERB When the people in a country rise, they try to defeat the government or army that is controlling them. rising plural N-COUNT ...popular risings against tyrannical rulers. Rise up means the same as rise. V P He warned that if the government moved against him the people would rise up... V P against n A woman called on the population to rise up against the government. 19) VERB If someone rises to a higher position or status, they become more important, successful, or powerful. [V prep] From an unlikely background he has risen rapidly through the ranks of government. Rise up means the same as rise. V P prep I started with Hoover 26 years ago in sales and rose up through the ranks. 20) N-SING: with poss The rise of someone is the process by which they become more important, successful, or powerful. The group celebrated the regime's rise to power in 1979. 21) PHRASE: V inflects, PHR n If something gives rise to an event or situation, it causes that event or situation to happen. The picture gave rise to speculation that the three were still alive and being held captive. • Smoke was rising into the air. • Bubbles rose to the surface of water. • The airplane rose [=(more formally) ascended] into the sky. • Smoke was rising up into the air. • The airplane rose up from the runway. • His spirits rose [=he began to feel happier] when he heard the good news. • The tide rose and fell. • The river is rising. • The land rises as you move away from the coast. • The road rose gently/steeply. • The mountains rose up before us. 2 : to advance to a higher level or position : to become more popular, successful, etc. • Empires rise [=become powerful, important, etc.] and fall. • The book has risen to the top of best-seller lists. • Sales have risen [=increased] in recent months. • People are angry about rising gasoline prices. • The population has been rising [=growing] dramatically/sharply/markedly. • Stocks rose (by) several points in early trading today. • The market is continuing to rise. • The wind rose in the afternoon. • My anger rose as I thought about what she had said. • The music rose and fell. • Her voice rose to an angry shout. • He rose slowly (to his feet). • She quickly rose from the chair and began to walk away. • He rose refreshed after a good night's sleep. • The sun rises [=comes up] in the morning and sets at night. • We watched as the moon rose in the eastern sky. • Yeast will make the dough rise. • The people rose in rebellion/revolt. • He told the people that they should rise up and overthrow the corrupt government. • Christians believe that Jesus Christ rose from the dead. • We need to rise above our anger/frustration and find a way to get along with each other. • She rose above the prejudice of her time to become a great civil rights leader. • It's time to rise above petty bickering/politics. • The quality of the food never rises above average. • No one was sure if he could handle the pressure of making a speech, but he rose to the occasion and did an excellent job. • When the company needed to increase its sales, its employees rose to the challenge. Come on, we haven’t got time to hang about! There were always groups of boys hanging about in the square. He normally hung about the house all day. Hang about – that can’t be right. • You hang around here in case he comes, and I'll go on ahead. I thought I'd hang around for a while and see if she comes. Go and pack but don't hang around - we have to go in an hour. I got into drugs because I was hanging around with the wrong people. [V P] On Saturdays we hang about in the park. [V P n] ...those people hanging round the streets at 6 am with nowhere to go. [V P with n] Helen used to hang round with the boys. [V P n] ...the usual young crowd who hung around the cafe day in and day out. • We just hung around all afternoon, listening to music. • They hung around the theater after the play was over. • She hangs around with older kids. • Who does he usually hang around with? Ali: Sue, would you please give me a hand with my math homework? Sue: Sure, I’ll do it if you promise to help me with the housework later. Scratch my back and I’ll scratch yours. 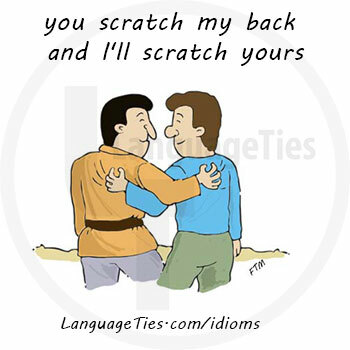 People say 'You scratch my back and I'll scratch yours' to mean that one person helps another on condition that the second person helps them in return. Can’t you see he has strung you around? There is no pay raise or promotion and he only wants you to do all his duties to go on holiday freely. 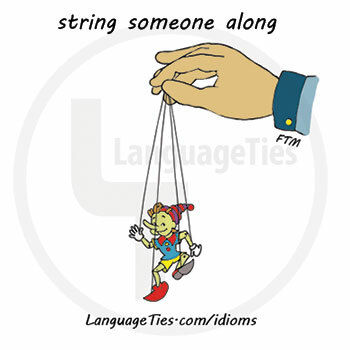 string along phrasal verb informal1 string somebody along to deceive someone for a long time by making them believe that you will help them, that you love them etc He’s just stringing you along.2 British English to go somewhere with someone for a short time, especially because you do not have anything else to dowith If you’re going into town, I’ll string along with you. She's been promising to pay back the money for six months, but I reckon she's just stringing me along. He strung her along for years, saying he'd marry her and divorce his wife. If you string someone along, you deceive them by letting them believe you have the same desires, beliefs, or hopes as them. He was speaking nonsense about world economy. He knew nothing about it. He only talked through his hat. 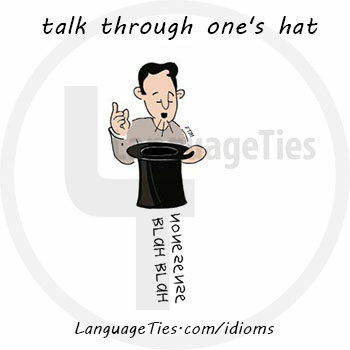 Nothing of what he said made sense - he was talking through his hat. Try to be as polite as you can; mind your behavior and try to be polite. Susie, mind you P’s and Q’s when Aunt Martha is here and be a little good sweet girl. She likes polite girls. I have to mind my p's and q's when I'm with my grandmother. 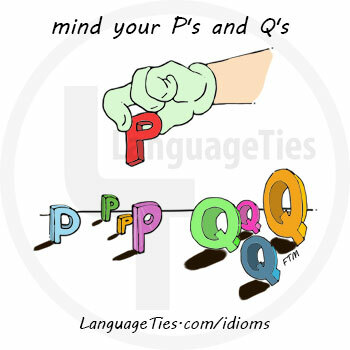 • We knew to mind our p's and q's around our aunt.